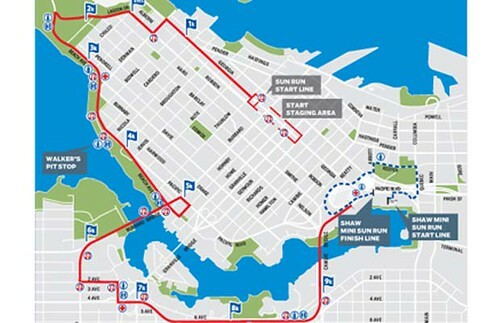 The Vancouver Sun Run, one of the world’s largest 10km road races, rolls through town this Sunday. A springtime staple in Vancouver since 1985 this fun run welcomes competitive runners, wheelchair racers, joggers, and walkers. They also host the Shaw 2.5km mini Sun Run. If you have signed up for this year’s event, stop by the Sun Run Fair at Concord Place May 6th, 7th, or 8th to pick up your race package (team captains can stop by Sun Run head offices on the 5th as well). You may also register last minute on those days however there is no race-day registration. Hours for the Sun Run Fair are 10:00am to 7:00pm (May 6th and 7th) and 10:00am – 5:00pm (May 8th). Along the course there will be entertainment, water stops, and walking breaks for those needing a rest. The course itself winds through downtown Vancouver, across the Burrard Bridge, alongside False Creek and back over the Cambie Bridge. The following road closures will be in effect this Sunday. Bute to the Causeway (including all streets crossing Georgia) 8:00 a.m. â€“ 10:30 a.m.
Spectators are welcome along the route and if you’d like to view part of the run from the comfort of your computer, check out the KatKam which points down at the Burrard Bridge and Sunset Beach. Race results will be posted online by May 13th. For more information you may follow @VancouverSunRun on Twitter. This year I will be running with my mouse from the comfort of my couch and a computer :). Maybe next year. Congrats to all the people that can do this and training every day for it.